The weather is finally warming up and I am dreaming of barbecues and picnics. 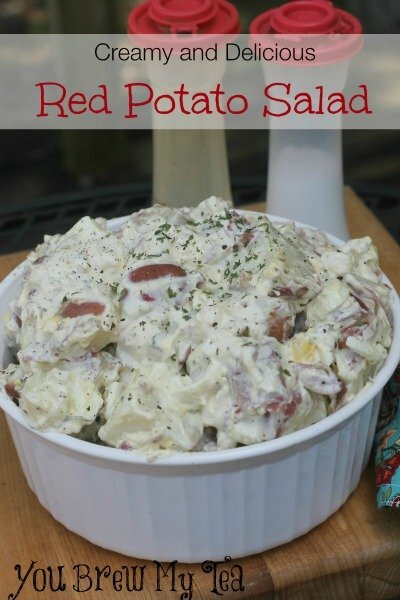 After you have your hamburgers, hot dogs, ribs, or other yummy foods off the grill, you have to have a Creamy And Delicious Red Potato Salad. My favorite Spring and Summer side dish is potato salad, and I have several variations I like to make. This one made with red potatoes is one of my favorites! Creamy, tangy, and full of flavor it is the perfect accompaniment to anything grilled outdoors but also fried chicken, sandwiches, or any other warm weather dish. Scrub potatoes well, dice into quarters or cut again for a smaller texture. Wash eggs very well, place in pot with potatoes fully covered in water. Boil potatoes until tender but not falling apart, drain water. Place eggs in cold water for 5 minutes. 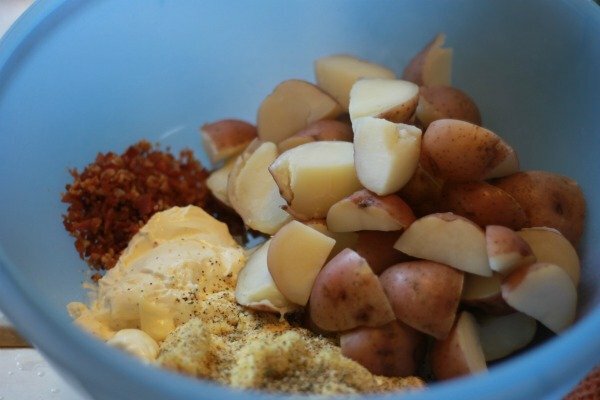 Combine potatoes, bacon, yogurt, mayo, garlic salt, pepper, onion flakes and parsley in a large bowl and stir well to combine all ingredients completely. Peel and dice eggs, add to contents of bowl and mix well. Transfer to serving bowl and refrigerate for at least an hour before serving. We love this as a side for all of our favorite grilled meats, BBQ dishes or even just a tasty side with simple sandwiches! 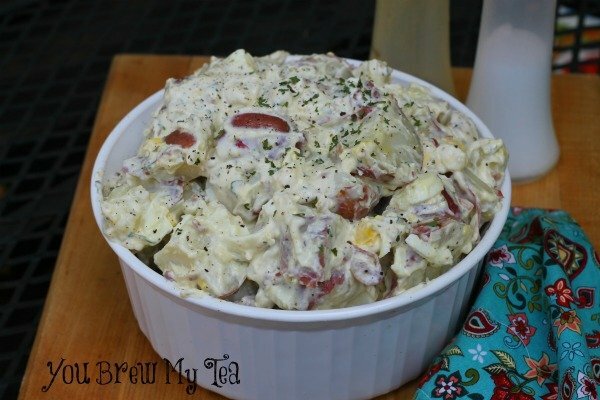 Check out this creamy and delicious red potato salad, as well as our other favorite items that go great with your favorite grilled items! It’s grilling season so this recipe fits right in with my springtime plans. I found your recipe over at the Two Cup Tuesday link party. I host Tickle My Tastebuds Tuesday and would love it if you would come over and share this recipe. I’m sure our party goers would love it! Here is the link http://bit.ly/1EylfPQ. 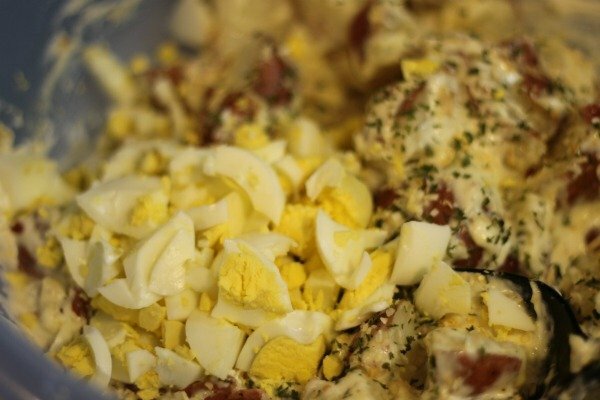 Your potato salad looks so good! I’ve been wanting to try adding Greek yogurt to potato salad, I’ll have to do that next time! This sounds delicious! I was just thinking about making potato salad today. Eating organic means all I will have access to is read potatoes for a while. I love the yogurt, pinned, followed you here from the Foodie Friday party.